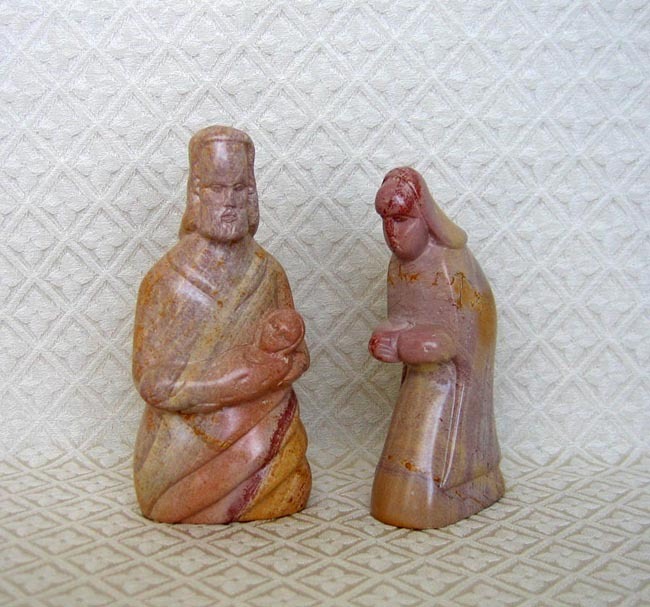 This Holy Family is carved from Kisii stone in western Kenya by David Anyona Mogunde. David is married with four children, all in elementary school. He grew up in a poor family where finances did not allow him to complete his secondary education. His greatest desire for his children is to provide them education to obtain better careers and employment opportunities and to break the cycle of poverty they were born into. David’s depiction of the Holy Family features a rare sight: Joseph holding baby Jesus. Mary stands next to Joseph with her hands in prayer. The Joseph figure measures 5.75 inches tall.